The U.S. October trade data showed that the U.S. imports continue to grow at a robust clip. The Chinese November trade release by contrast showed a significant weakening in Chinese import demand. Up until now China’s imports had been surprisingly strong even as other signs suggested that China’s overall economy was slowing. Both are important data points going into 2019. 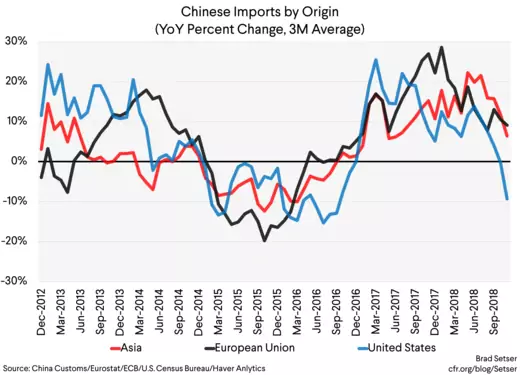 Combined growth in both Chinese import demand and U.S. import demand (Trump’s stimulus has overwhelmed his protectionism) in 2017 and 2018 drove the recovery in global trade, and helped propel Europe’s growth. 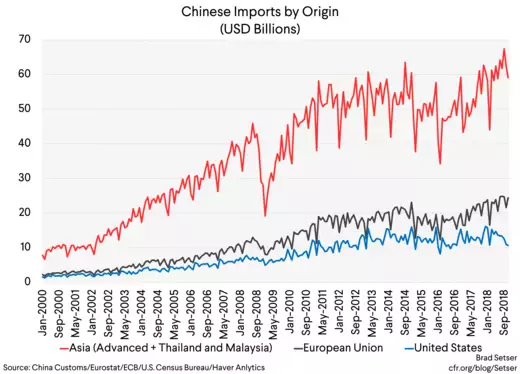 With Chinese demand now faltering and Europe showing signs of weakness, the United States is now at risk of becoming the sole remaining engine of global demand. And that feels risky, as, well, Trump has consistently been against a rising import bill. At least in theory. His fiscal policies of course have predictably pushed U.S. imports up, something that is likely to be increasingly apparent as the q4 data continues to roll in. The October U.S. trade data release. 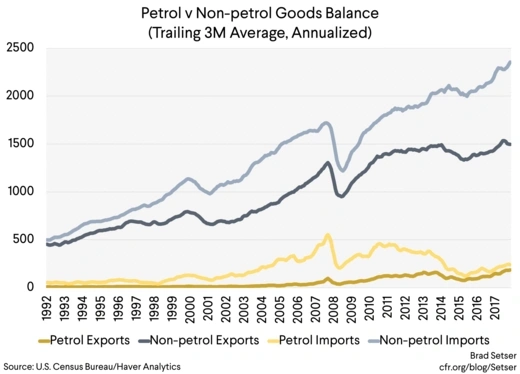 The overall U.S. trade balance these days is the tale of two very different stories—a falling trade deficit in oil (higher production, and now, again lower prices) and a rapidly rising deficit in non-petrol goods trade. * There just isn’t much of a story in services trade in the past few years; the U.S. services surplus has been broadly constant—the action has been on the goods side. 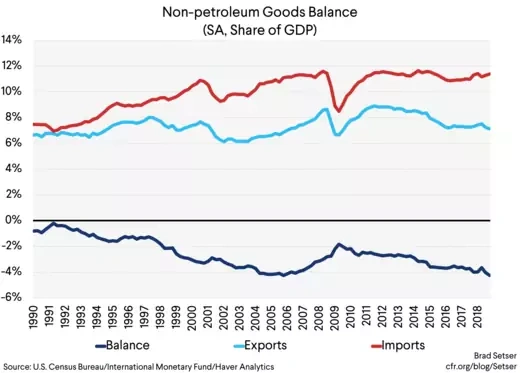 Because the overall trade deficit hasn’t changed that much, I don’t think the rise in the deficit in non-petrol goods trade (and in manufacturing trade) has gotten as much attention as the scale of the underlying shift warrants. Since 2014, the non-oil goods deficit has basically doubled in dollar terms—initially because of a fall in exports after the dollar’s rise, increasingly because the stimulus has raised U.S. import demand. That’s a big swing, one big enough to overwhelm the dramatic improvement in the oil balance. That story this year was complicated because the trade deficit unexpectedly fell in the second quarter of 2018. But it is now clear that this was a false positive signal, as it was a function of a set of one-offs—the soybean pre-tariff surge, a pause in the growth in imports are a large rise in q4 of 2017—rather than a break in the basic narrative. In q3 the non-petrol deficit rose steadily, and October’s deficit was higher than that of q3. The trade deficit in manufactures is now consistently topping exports—e.g. for every dollar of manufactures the United States exports, it now imports two. Manufactures here is adjusted to exclude refined petroleum. Obviously, the manufacturing deficit isn’t new. But the scale of it is. In a world of regional supply chains, North America's deficit supplies the net demand for manufactures needed to sustain large surpluses in Asia and Europe. 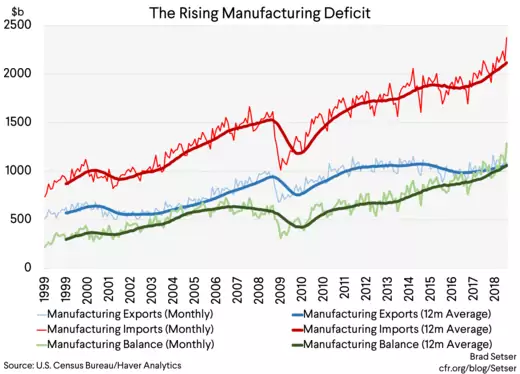 The deficit in manufactures—as Eduardo Porter highlighted in a recent article—has important geographic consequences. Manufacturing was once an important source of employment in a number of small towns. The “real” goods data is if anything a bit worse, as the price of imports has been falling a bit, so the rise in real imports top the rise in nominal imports. 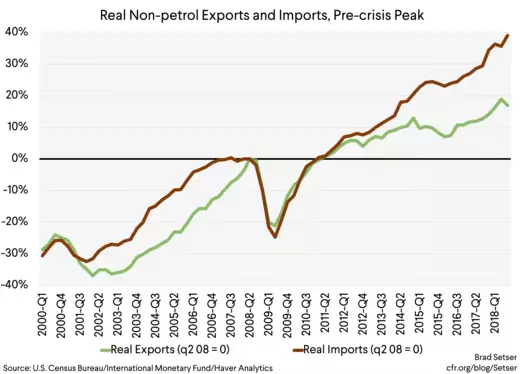 Real non-petrol imports are now up more than two times as much as real non-petrol exports in the post-crisis period. Nominal GDP has been growing—so the swings are smaller as a share of GDP (and until recently the widening deficit largely reflected a fall in exports as a share of GDP). But as the data from the last half of 2018 rolls in, the non-petrol goods (and non-petrol goods and services) deficit is starting to widen as a share of GDP too. The broader balance of payments still benefits from the post-crisis fall in nominal interest rates (which has held down the interest bill on a net external debt that approaches 50 percent of GDP if you leave out the “gold” at Fort Knox) and the United States' substantial offshore profits (largely in the world’s low tax jurisdictions). But the q3 current account deficit rose significantly, after a surprise fall in q2. Why care—well, Trump was elected on a promise that he would make American manufacturing great. But his policies really have been a boon to the United States' trade partners. The surpluses that both China (reflecting the broader East Asian manufacturing ecosystem) and the euro area run with the United States are up substantially. Trump’s stimulus was in many ways a global stimulus. 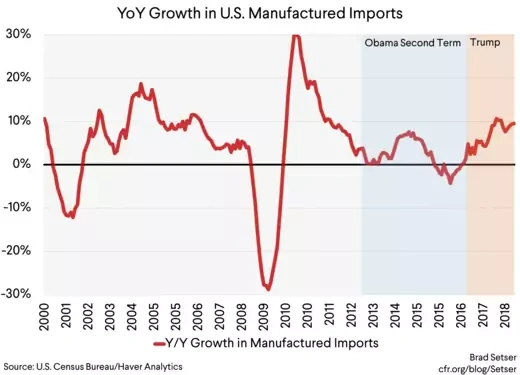 U.S. imports of manufactures are now rising by around 10 percent y/y (a bit faster than the overall economy), well up from the 2 percent growth rate (an admittedly slow pace of growth) in the last four years of the Obama administration. Most obviously, because demand growth is likely to slow a bit from its rapid 2018 pace, and import growth reflects strong demand growth (as well as the strength of the dollar). And, if Trump does go ahead with either the threatened tariffs on China or the threatened tariffs on autos it will in the short-run add a substantial fiscal drag to the United States—as there is no realistic way to replace all imports from China or all imports of autos with U.S. production in the short-run. So higher tariffs will result in higher prices for consumers (less spending) and a rise in government revenue (as many firms will have no choice but to pay the tariff). Frame this however you want: Trump undermining his own stimulus with his trade policies, or as an end to a free ride the U.S. fiscal stimulus provided to the world over the last year. Either way, it would put new pressure on the rest of the world—and Europe in particular—to find domestic sources of growth. China isn’t quite as big a source of global demand—at least for manufactures—as its rapid growth would imply. 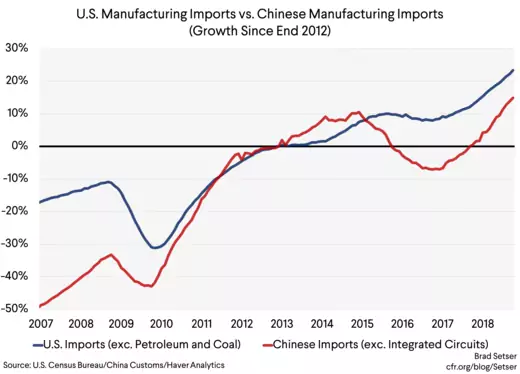 Since 2012 China’s economy has expanded by about 41 percent (in real terms) but its imports (in dollars) of manufactures are only up about 15 percent if you take out semiconductors—where there has been a big price hike that is now reversing. U.S. imports are up far more (off a bigger base). The recovery in its non-semiconductor import demand, along with Trump’s stimulus, helped drive the broader revival of global trade in 2017 and 2018. Chinese demand wasn't all commodities either, imports from both Europe and the rest of Asia jumped (after broadly stalling after 2012). And it now seems that China’s demand growth is faltering. Admittedly, the story is complex. Oil import volumes are up, coal and iron imports may be down for administrative reasons, and China (still) imports in order to export. Real export growth of only 1 percent y/y (per Tao Wang of UBS) implies less need for imported parts. But it is now hard to believe that Chinese demand itself has not slowed. The downturn in imports in November was fairly broad based. And perhaps slowed by more than has been officially reported. See Keith Bradsher and Ailin Tang. Now China is poised to do some sort of stimulus, one that may help support import demand over the course of 2019. But for now, one of the main engines of the global trade recovery of the past two years has faltered. One final point before signing off. China stands to benefit from a sizeable positive shock to its terms of trade. What are China’s two biggest imports? Integrated circuits/semiconductors ($300 billion in 2017) and crude oil and petroleum products (over $200b). 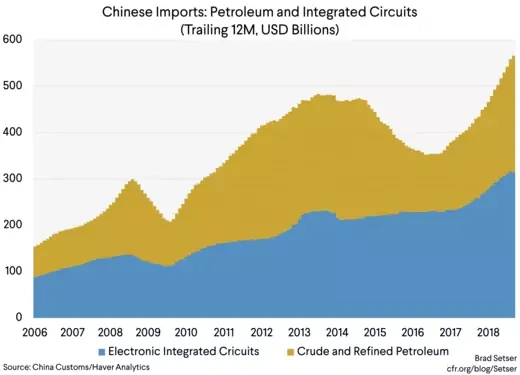 Together, these two products account for about a quarter of China’s total imports (to be sure, some imported semiconductors are re-exported as finished electronics, but China’s new economy uses some domestically as well). And the price of both are now falling. Memory chip prices are down by about 10 percent, and could fall by more. Oil is now well under $60 (WTI is even lower). That’s going to help China’s trade balance. It isn’t clear to me that—absent a Trump tariff shock—China’s trade deficit will continue to shrink and that the current account will swing into deficit. I suspect that we are at least at a temporary inflection point on China’s import growth, with a clear shift down for a few months. China’s surplus could rise even as its export growth slows sharply. 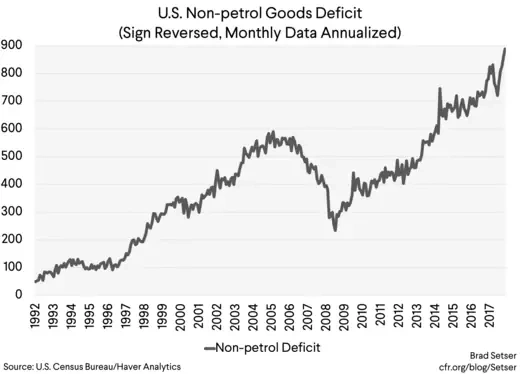 And I am waiting for signs that the recent surge in the non-oil trade deficit in the United States is fading—with strong overall demand growth it has had a bigger impact on the composition of output and employment than on the level of output and employment. But, unlike some, I do think the absence of any sustained (non-oil) export growth since the dollar appreciated in 2014 is an underlying point of weakness for the United States. When the tides turn and the United States needs to draw on global demand to support its growth, it may lack the export base needed to benefit from the opportunity… a 10 percent fall in the dollar that boosted real manufacturing exports by 10 percent would now only deliver a half point boost to U.S. growth… and the numbers don’t get that much better if you add in agriculture. * Service trade is in my view a bit over hyped for the United States—the transport of people and goods is still the biggest category of services trade, and, well that is really a function of tourism and goods trade. A bit too much trade in intellectual property and in financial services currently involves a low tax jurisdiction for my intellectual comfort. The monthly data also doesn’t provide much information, as services trade is poorly measured in general and largely estimated in the monthly data. Why Hasn't China Needed to Intervene More This Year?